I love this recipe! Totally not your traditional chicken dinner. This meal offers a complete food indulgence experience. How this recipe holds up under all of the flavors, I do not know! It is spicy, and at the same time refreshing. Warm and at the same time cool. It has so much going on, but yet, it’s not too much. As you can tell it’s kind of hard to put into words, but all I can say is this is one of the most original things I have ever had the opportunity to make. I don’t even know what to compare it to. All I’ve got to say is, this chicken is an explosion of flavors at the end of a fork. One of those things that you gotta try to understand, so do! You won’t regret it! Oh, and one more thing, it’s low calorie!! Tastes great and your not going to feel guilty for eating it. Gotta love it. Preheat the broiler. Make shallow cuts in the chicken thighs with a sharp knife. Toss the chicken with the lemon juice and 1 1/2 teaspoons salt in a large bowl. Pulse 2 tablespoons yogurt, the vegetable oil, onion, garlic, ginger, tomato paste, coriander, cumin, 1 1/2 teaspoon paprika and 1/2 teaspoon salte in a food processor to make a paste. Toss the chicken in the mixture and let marinate 15 minutes. Place the chicken on a foil-lined broiler pan. Broil, turning once, until slightly charred and a thermometer inserted into the center registers 165 degrees, 5 to 6 minutes per side. Meanwhile, combine the remaining 1/2 cup yogurt and 1/4 teaspoon paprika, the cilantro and pinch of salt in a bowl. 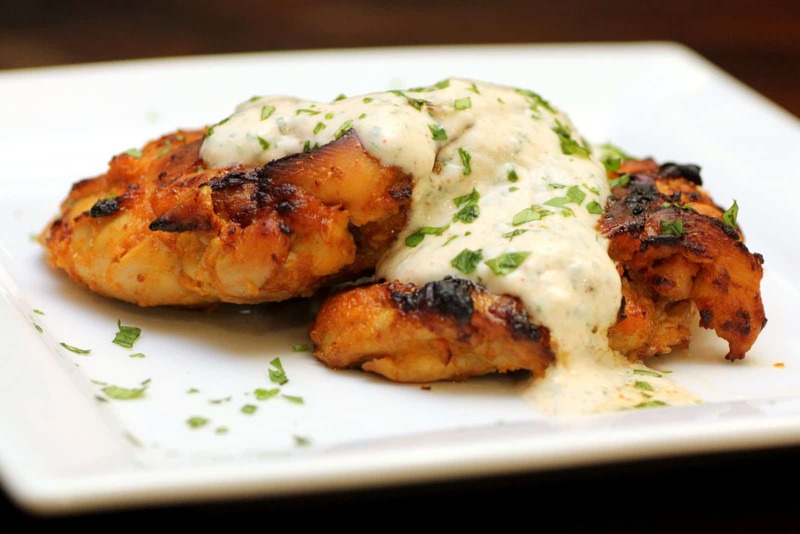 Top the chicken with the yogurt sauce and serve with rice, if desired.